What do snails have in common with poems? 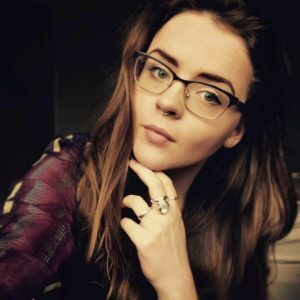 After reading two snail poems on Twitter, Holly Singlehurst (a poet commended in the 2016 National Poetry Competition) realises how much we as poets can learn from our tiny trail-making friends. If you asked me only a few months ago what I thought about snails, their relevance to poetry certainly wouldn’t have sprung to mind. But it turns out these small, slimy creatures have more in common with poetry than you might initially think. I recently came across two wonderful poems: Aracelis Girmay’s ‘Ars Poetica’ and Martha Eleni Pack’s ‘Snail Sadness’. These poems showed me how strangely beautiful a snail can become when seen through the eyes of a poet, and how surprisingly useful they can be for understanding the writing process. Snails have been running – well, sliding, perhaps – through my mind ever since. of the foot’s silver prayer. When I first read this compact, glistening gem of a poem, I caught my breath. Not once had I ever thought of a snail’s slime, glinting on the garden path or up a wall, as particularly beautiful. But there it was, a ‘silver prayer’, a record of everywhere that snail had been. The snail’s journey, and therefore the act of writing a poem, becomes almost divine through Girmay’s words. A prayer of thanks. Proof of a life lived, and gratitude for that life. I love my slime that I leave behind. It makes me feel like I leave the sadness behind. I am presuming that 8-year-old Pack had not read Girmay’s poem, but there are some interesting similarities to note between the two. They are both small and compact on the page, like a snail in its shell; they both focus on the snail’s trail and give it symbolic meaning; and, whilst Girmay’s is more explicitly about poetic creation, they can both be read as a commentary on the creative process. Whilst Girmay’s snail trail is a prayer of thanks, Pack’s trail is ‘slime’, and in leaving that slime behind, the snail feels like it has left the sadness behind. Writing poetry can be a way to process a feeling or an experience, and to ‘leave it behind’ on the page like the snail’s trail. Reading poetry can also be a healing exercise. Indeed, snail slime itself is proven to have healing properties, effectively treating burns, minor wounds, and surgical scarring. A snail is not only notably small, but notably slow. Indeed, there is no need to rush writing poems, or to think that just because a poem is short it shouldn’t take very long to write. It is always worth spending time with poems after they may seem ‘finished’, and most writers would agree that taking the time to edit them is a very important part of the writing process. (Find some useful editing tips here.) 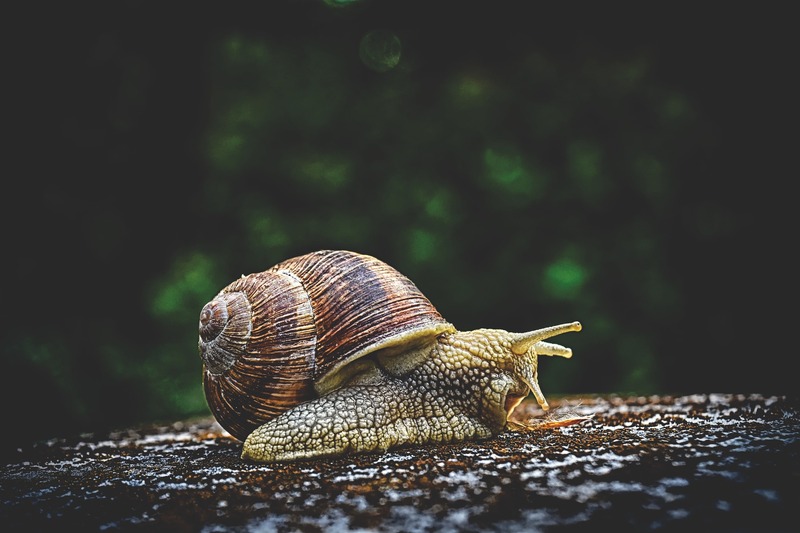 We shouldn’t worry if it feels like we are writing slowly, either – a snail is one of the slowest animals on the planet, taking over 21 hours to move just 1 kilometre (0.6 miles), but that doesn’t stop it from making its steady, glistening journey across the garden path. 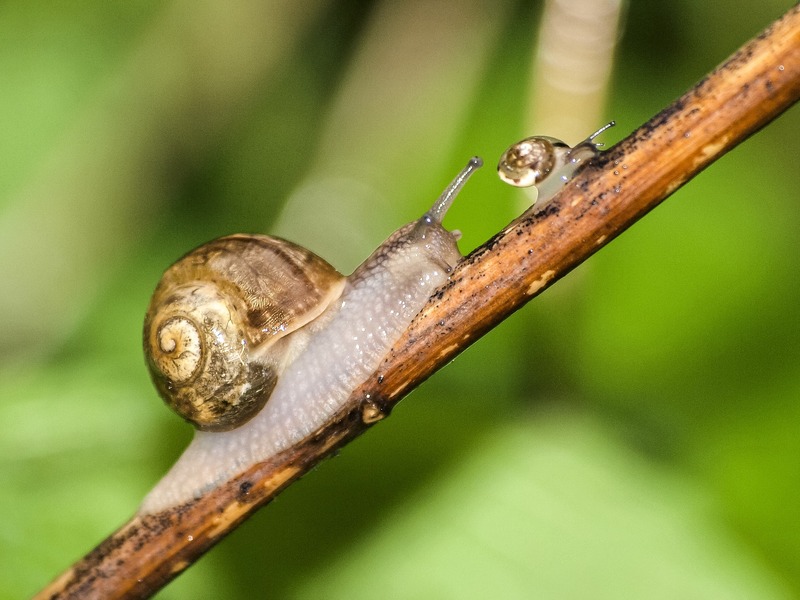 Interestingly, if a snail does want to move faster, it will follow in the trail of another snail – and sliding on this trail will enable it to arrive at its chosen destination that little bit sooner. Of course we all want to make our own way, and leave our own trail, but reading poets who we admire is a great way to help us on our own creative journey. 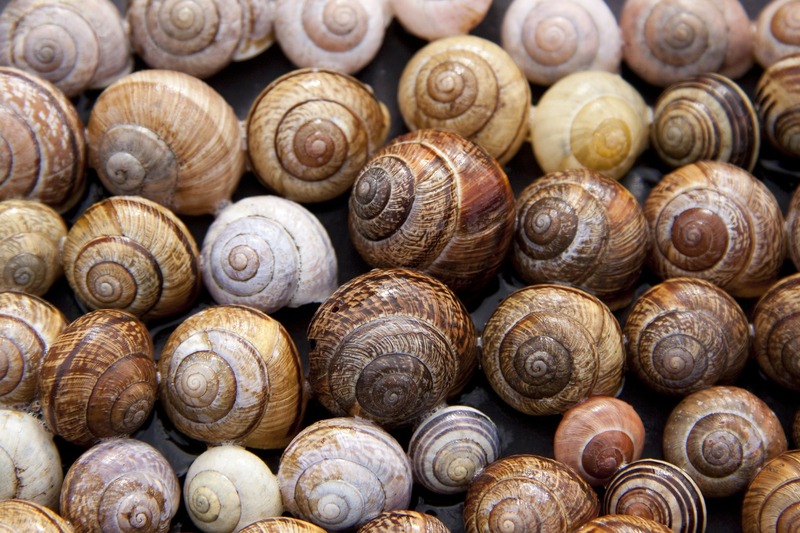 Snails, and their shells, are also a useful way to think about the structure of a poem. Shells are exoskeletons, which protect the snail’s soft body from the outside, in contrast to endoskeletons, which support bodies from the inside (like ours). One of the most important pieces of advice I have been given is to make sure my poems have a scaffolding or a skeleton. 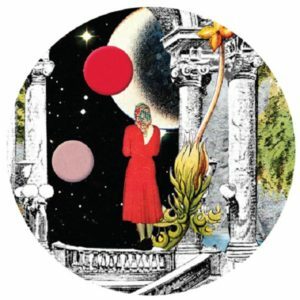 Poems do need some structure, but it doesn’t have to be the same kind of structure for each poem, nor does it have to be a specific poetic form. It’s always worth asking – does my poem have an endoskeleton, which holds it up from the inside? Does it have an exoskeleton, protecting its tenderness from the outside? Or does it, like the tortoise, have both? One of the more eccentric writers in recent history, Patricia Highsmith, was famously fond of snails. Indeed, she would take them with her to parties, preferring their company to people, and would often have hundreds of them feasting on a cabbage in her bag. Whilst I wouldn’t recommend this habit, I too tend to carry what I love with me wherever I go, and my bag is always filled with poetry that inspires me. That is something which I would wholeheartedly recommend. So what can we learn from these slimy, shelled creatures? Pay close attention, even to the smallest things. Edit thoroughly. Write with structure. Make the ordinary extraordinary. Write poems which leave your sadness behind you. Write poems which praise. Read poems which heal your wounds. Write poems that record your journey. Carry poems with you. Read poets who inspire you. Write words which are silver and glistening, which are ‘climby’ and ‘crawly’ and ‘clever’. If you’re aged 17 or older why not enter the National Poetry Competition? This year’s judges are Kei Miller, Kim Moore and Mark Waldron, and the first prize is £5,000. But hurry – 2018’s competition closes midnight GMT Wednesday 31 October. Enter now. What a brilliant and unusual article! Thank you.